Posted on Monday, May 23rd, 2005 at 7:00 am. Subscribe to the comments feed. Both comments and pings are currently closed. Post on your own blog. Is that infinity ribbon on the site? I couldn’t find it. Something tells me that they wouldn’t because it would be meaningless for anything else. 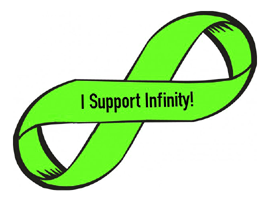 It screams infinity (or, I suppose, “Support Moebius Strips!”).